William Howard Taft (September 15, 1857 � March 8, 1930) served one term as President of the United States from 1909 � 1913. 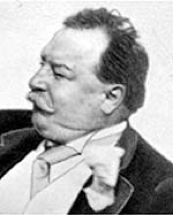 Taft was the 27th President of the United States. 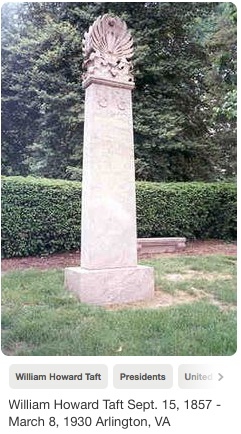 He was born September 15, 1857 in Cincinnati, Ohio, and lived till March 8, 1930, when he died in Washington, D.C. He married Helen Herron June 19, 1886. They gave issue to three children, Robert, Helen and Charles. 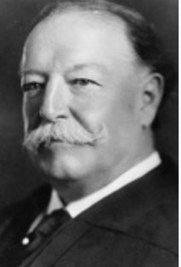 Taft�s college degree was from Yale University, and his LLB degree in law was from the University of Cincinnati. The Taft family was not wealthy, living in a modest home in the suburb of Mount Auburn. His father, Alphonso Taft, served as a judge, ambassador and in the cabinet, as War Secretary and Attorney General under Ulysses S. Grant. Commercial newspaper, edited by Murat Halstead. Taft was assigned to cover the local courts. He also spent time reading law in his father's office; both activities gave him practical knowledge of the law that was not taught in class. Shortly before graduating from law school, Taft went to the state capital of Columbus to take the bar examination and easily passed. On June 30, 1921, U.S. President Warren G. Harding�s nomination to the U.S. Senate as Chief Justice of the Supreme Court, former President William Howard Taft, was approved. Taft is the only person to have served in both of those high offices. 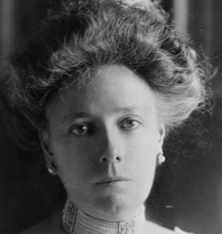 William Howard Taft is the first cousin of the husband of my seventh cousin, once removed, Eleanor Kellogg Chase. The ancestors in common with Eleanor and me are Joseph Kellogg and Joanne Foote, both born in the 1620�s in England, and who immigrated to Massachusetts. They are her sixth great grandparents and my seventh great grandparents. Eleanor Kellogg Chase�s family has connections to the J.P. Morgan - Chase Manhattan Bank of New York, as well as the Kellogg part related to Will Keith Kellogg, the founder of the company known today as Kellogg�s Special K (the dry cereal products), and Nobel Peace Prize winner Frank Billings Kellogg. There have been 17 Supreme Court Chief Justices (they serve life time tenures) over the history of the United States. The President nominates a judge to the U.S. Senate, which debates such nomination, then votes on whether to approve the nomination. There have been eight of the 17 Chief Justice votes that were by acclamation (no votes against). Taft is included among those honored eight. Though our family has relationships attributed to 17 of the 45 U.S. Presidents who have served, Taft is the only one of our family who has served as a Chief Justice of the United States. The Chief Justice not only heads up the Judicial Branch of our National Government, that Justice is the presiding Judge over the Supreme Court. The Supreme Court is unique in that it hears only cases that are appealed to it from a lower Federal Court ruling. A case may have gone before several State and Federal Courts, but the losing litigant in the most recent trail may appeal to a higher court. The Supreme Court considers only the appealed cases it chooses to adjudicate. Only about one percent of all cases appealed to the Supreme Court are chosen to be considered. The remaining 99 percent remain with whatever decision was adjudicated in the most recent hearing. An attorney for each side of a case will have an opportunity to make a presentation to the Court and answer questions posed by the Justices. Prior to the argument each side has submitted a legal brief�a written legal argument outlining each party�s points of law. The Justices have read these briefs prior to argument and are thoroughly familiar with the case, its facts, and the legal positions that each party is advocating. The Justices announce their several decisions at specified times. The nine justices vote and the vote count is public information. In recent years, it seems that many decisions were influenced by the justices� views about interpreting the original U.S. Constitution. The short-hand description is liberal versus conservative views. President William Howard Taft was the last U.S. President to wear any type of facial hair (beard or mustache). 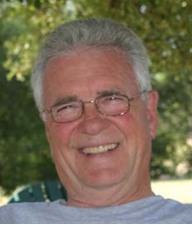 His son, Robert (also known as �Mr. Republican�), became one of the twentieth century�s most influential senators; his grandson�William Howard Taft IV�went on to tackle various executive duties for Ronald Reagan and George W. Bush. Hall of Famer Walter Johnson managed to snag a low-flying ball Taft gracelessly lobbed from the stands at the start of a 1910 Washington Senators game. One hundred and seven years later, this opening day tradition�s still going strong. It�s hard to demean someone whose spouse is sitting right in front of you. After her husband won the Republican presidential nomination, First Lady Helen Herron �Nellie� Taft made a beeline for the Democratic National Convention in Baltimore. Grabbing a front-row seat, she stared down orator after orator, including the cantankerous William Jennings Bryan of Nebraska, who suddenly decided to soften his anti-Taft rhetoric. For the record, Nellie called him �Sleeping Beauty� due to Taft�s bad habit of dozing off at parties (more on that later). As Chief Justice, he administered the oath of office to fellow conservatives Calvin Coolidge and Herbert Hoover. Taft is remembered as the heaviest president; he was 5 feet 11 inches (1.80 m) tall and his weight peaked at 335�340 pounds (152�154 kg) toward the end of his presidency, though this later decreased, and by 1929 he weighed just 244 pounds (111 kg). By the time Taft became chief justice, his health was starting to decline, and he carefully planned a fitness regimen, walking 3 miles (4.8 km) from his home to the Capitol each day. When he also walked home after work, he would usually go by way of Connecticut Avenue and use a particular crossing over Rock Creek; after his death the crossing was named the Taft Bridge. It is alleged in the Wall Street Journal (March 17, 2018, P. C20) that once President Taft sent a letter to a mother saying that her son would be accepted into the United States Military Academy at West Point, despite his physical shortcomings. Her reply of appreciation included the statement, �Mr. Secretary (misapplying his title), you are not nearly so fat as they say you are!� So much for this humor, a story it is said the President Taft repeated himself several times. Taft insisted that Charles Evans Hughes succeed him as chief justice. At Hoover's inauguration on March 4, 1929, Taft recited part of the oath incorrectly, later writing, "my memory is not always accurate, and one sometimes becomes a little uncertain," misquoting again in that letter, differently. His health gradually declined over the near-decade of his chief justiceship, and he wrote in 1929, "I am older and slower and less acute and more confused. However, while things continue as they are, and am can answer to my place, I must stay on the to prevent the Bolsheviki from getting control." Regardless of Taff's seemingly somnolent approach to governing, he did have notable accomplishments. He was an efficient administrator, serving under several with distinction, according to Mr. Henry Stimson, who served under Taft, Franklin Roosevelt, Harry Truman and Herbert Hoover (Forbes Magazine, June 30, 2018, page 16). Trivia cited in that Forbes issue includes the tradition of being the first President to throw the opening pitch of the baseball to open the season, and he started the seventh inning stretch! That Forbes issue goes on to cite his accomplishments to reform practices of the U.S. Supreme Court, making it a truly equal branch of government. Taft Biography writer, Jeffrey Rosen, concluded that Taft was the most consequential Chief Justice since John Marshall. Taft�s faith was cited as Christian, though his affiliation with the Unitarian Church disturbs some of other Christian denominations or groups. Here is an address he delivered as President of the General Conference of Unitarian and other Liberal Christian Churches. Taft insisted on going to Cincinnati to attend the funeral of his brother Charles, who died on December 31, 1929; the strain did not improve his own health. When the court reconvened on January 6, 1930, Taft had not returned to Washington, and two opinions were delivered by Van Devanter that Taft had drafted but had been unable to complete because of his illness. Taft went to Asheville, North Carolina for a rest, but by the end of January, he could barely speak and was suffering from hallucinations. Taft was afraid that Stone would be made chief justice; he did not resign until he had secured assurances from Hoover that Hughes would be the choice. Returning to Washington after his resignation on February 3, Taft had barely enough strength to sign a reply to a letter of tribute from the eight associate justices. He died at his home in Washington on March 8, 1930.